The LeBron James sweepstakes are officially in full swing, and I’m already exhausted by it all. The Cleveland Cavaliers‘ season finale isn’t even a week old, yet we have sources everywhere labeling their latest rumor on James’ next destination as gospel truth. What we’ll likely hear very little about in the coming weeks is any reason why James should stay in Cleveland. It’s just not a narrative national outlets find too appealing, as it’s far more fun to explain why literally any other team would be a better option for him. This, of course, doesn’t mean James won’t flee from the Cavs again. It’s a very real possibility, and there’s no bigger reason for this than the men running Cleveland’s front office. 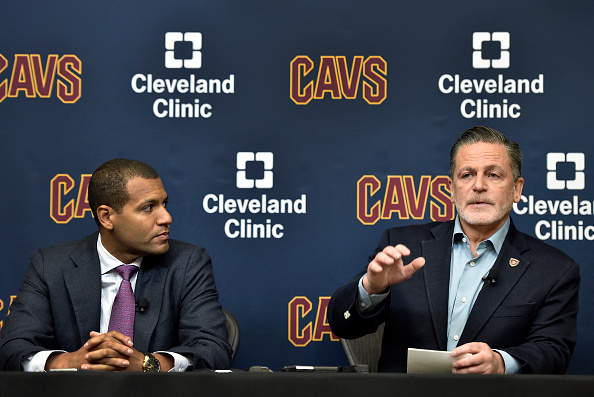 Simply put, returning to the Cavs requires trusting GM Koby Altman and owner Dan Gilbert to assemble a team capable of dethroning the Golden State Warriors. Based on everything we’ve seen in the past year alone, this would be one hell of a leap of faith for James. His relationship with Gilbert has already received tons of media attention. The owner’s spiteful response letter after James’ 2010 departure still seems to be a hot-button issue. Gilbert choosing to let former GM David Griffin walk last summer was also a disastrous move, one James clearly disagreed with. As for Altman, he’s known for two major trades which initially looked solid, but eventually imploded in the team’s face. His controversial decision to move disgruntled guard Kyrie Irving turned into a monumental misfire, as the returning assets were underwhelming (the Brooklyn Nets first-rounder), never fit in (Jae Crowder) and caused everyone in the locker room to hate each other (Isaiah Thomas). It was made worse when James revealed he called the front office before the deal and asked them not to trade Irving. Altman received brief praise when he swapped bad fits for some badly needed youth at the trade deadline. However, said younger players struggled mightily in the postseason, seemingly spooked by the bright lights of playoff basketball. The lack of support James received from Jordan Clarkson and (barring Game 3 of the Finals) Rodney Hood was a crucial blow to Cleveland’s postseason hopes. Just as the questionable decisions from the front office make swaying James to stay an uphill battle, so, too, do the reports claiming the Cavs have already been making plans under the assumption he’s on the way out. This isn’t necessarily a bad thing. No fans want to couple another James departure with years of painfully inept basketball again. As important as it is to make sure the team isn’t destitute should James leave, the Cavs still must make a concerted effort towards convincing him to stay. Moving forward under the assumption it’s not worth trying to woo him is the opposite of that, and is far more likely to push him out the door. While it’s obviously important to have a backup plan in the very possible scenario of James leaving, the priority for the Cavs’ front office should still be figuring out moves to make that’d entice him to stay. Again, staying in Cleveland requires trusting the front office to construct a championship-caliber roster. This means relying on an owner he doesn’t see eye-to-eye with and a GM with two questionable trades on his resume, one of which James didn’t want the team to make. These two may also already be accepting James’ departure as the most likely outcome. It’s not exactly confidence-inspiring stuff. Here’s hoping James feels otherwise.